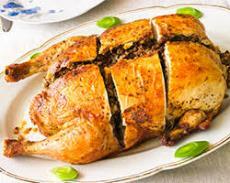 Pollo Relleno (Stuffed Chicken) - Tienditadepuertorico.com - Buy Puertorican Food Here!! In bowl combine cornmeal and taco seasoning mix. Place egg in another bowl. For each roll, place a chili pepper half on a chicken piece. Place a cheese stick atop chili pepper near an edge. Sprinkle with some cilantro or parsley, black pepper, oregano, cumin and red pepper. Fold in sides; roll up jelly-roll style, starting from edge with cheese . Dip rolls into egg and coat with cornmeal mixture. Place rolls, seam sides down, in shallow baking pan. Bake, uncovered, in a 375 degree Fahrenheit oven for 25 to 30 minutes. If desired, sprinkle chicken with shredded cheese. Serve with taco sauce or salsa. If desired, garnish with cilantro sprigs.